Hello again! Sorry for the teaser on Friday. It’s been a busy, awesome weekend. I have a few recipes up my sleeve for those occasions when I have neither the time nor the energy to make an elaborate meal, and when it comes to taste and satisfaction, spicy chickpeas are pretty high on the list for crunch time. In fact, the most time consuming part of preparation is chopping the onion! 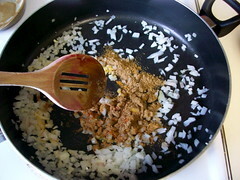 In a skillet, saute about half of a large onion in olive oil. When the onion is slightly transparent, add your spices. The aroma that fills your kitchen when these hit the heat is so amazing! 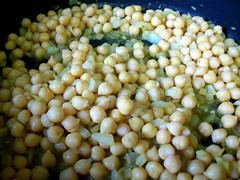 Next, toss the rinsed and drained chickpeas (also called garbanzo beans) into the skillet. 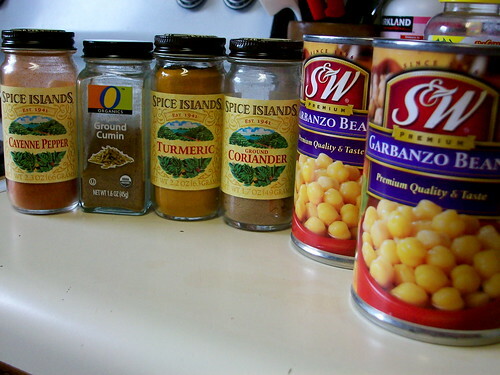 You’ll need to add about 1/4 cup (maybe a little less) of water right away, otherwise the chickpeas can get scorched. 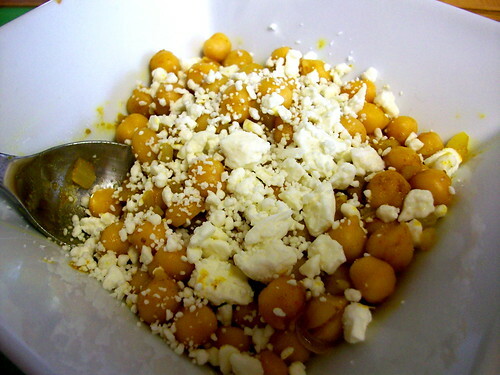 After the water has evaporated a little, squeeze half of a lemon over the chickpeas. You’ll want to (carefully) taste at this point, and feel free to add more spices or lemon juice. Sometimes I even add a little paprika at this point. It’s not in the recipe, but I like the variety of spices. Keep the heat on medium to medium low, and stir pretty continuously. When the shells start separating from the chickpeas, you’re ready to plate. If you’re a traditionalist, you’ll want to add some fresh cilantro over the top. Usually, I like the traditional route, but I’ve never really “dug” cilantro. Weird, I know, but it’s just not one of those flavors I’ve managed to get into. I do, however, love to top these babies off with plenty of feta! Doesn’t that look amazing!? So hearty and delicious for so little work. You can find the original recipe here, but just be ready to double it if this is your main course. I’ve also strayed a little from the original preparation instructions. Try it their way first, and then adapt as you get comfortable. Usually, when we have more time, I marinate and grill tofu to pair with spicy chickpeas, but a giant vegetable salad is also great for adding volume to this meal. 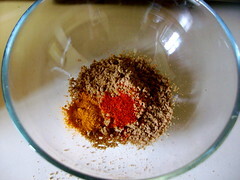 It also helps cut the spice a bit. This also works great the next day for lunch (if it doesn’t all get eaten the first night, that is). This looks amazing!!!! I am going to try it for sure!!! Next Next post: Apple Pressing Party!